In this topic, I will lay out the firmware, make by me for Samsung GT-B7300 Omnia Lite. My Russian roms You can see what I have done before for Russian and Ukrainian users. I do Russian firmware for Samsung GT-B7300 is already half a year, but I'm often asked to make an English version. This is my first English firmware WM 6.5.5 21665 light. Firmware is fully functional and complete. But in case of mistakes will be corrected. Added smi wm pro sdk redist 2.2.0, 1.0, HTCSensorSDK.dll and Fixed many minor bugs. Orders for Custom Firmware, contact the personal. I might add, to remove almost any program, themes, ringtones and sms tviki registry, in short all that you want only your money (price from $ 10 to $ 30 depending on the scope and timing of implementation, 20% of the scrip to pay in advance). hi.very thanks for your Rom. i realy waited a long time for a coocked rom for my phone and finaly you coocked it!. now i have a question. now my firmware is B7300XXJC2 and i want to know can i flash this firmware on my phone or it may be break? Hi! Thx for the rom. I've seen that the firmware is in english. Can i install it in Italian? The firmware is great but would be better knowledge mult including German, etc. Yeah, thank you so much. I looking for a costum 6.5.x ROM a long time. But, can you make a multilanguage version? Or can you make a czech ROM? Thanks for respond and your hard work. 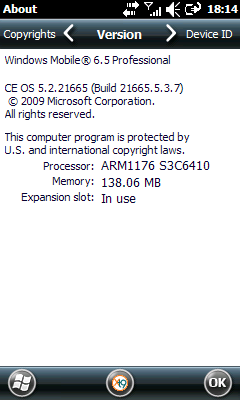 Very nice Rom, I love and use it now. Only one thing I have found, when press the battery icon to see power status ,it said no "Power.exe" file. hi. my current firmware is B7300XXJC2.can i flash this rom on my phone? or not? Use the upper download link from this topic. Flash only PDA and it turn your phone to 6.5.5. Please use your own .csc or stay at the default csc like mine. Install programs that you love to use, becuase this rom eliminate many programs that came with original firmware. I like this rom, it easy to use than 6.5.
now please check your downloaded file size and PDA_21665 eng .nb0 file size and look that are same with mine? 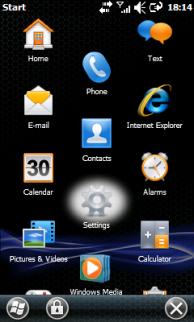 hi.very thanks for this rom.finaly i flashed it on my phone and it work very good.i realy very happy for this rom. hi.how can i have a taskbar like this? Hey, thanks. I saw your CSC. That is a evidence that I can flash my phone to 6.5.5 safely! anyway, how about free ram left? and free storage left? Is there anybody flashed rom to this one tell me this. And I still love some samsung apps such as widget plus. Where can I find CABs to install samsung stocked rom apps? Also, the previous thai rom XXIK1 has device.exe high cpu load issue when there is file operation on the phone, in some situation such as receiving file via bluetooth, the device.exe will use all the cpu power, or when I transfer file to device from PC via wifi, activesync, usb mass storage, the cpu load is high too. And the last issue, whenever the device play sound with builtin speaker on any apps. The device.exe will use 25% of CPU(If play sound with SRS enabled in samsung touch player app, cpu will load aroung 30%). Which can drain a lot of battery when listening to music, and slow down the device performance. But whenever I plug in the earphone, the CPU load will decrease to 6%. (If SRS enabled when listening to music, the cpu will load 25%). Does the device.exe high cpu load I explained above been fixed? What about proper OpenGL driver? any hope for a newer build ??? Yes, I found a bug that make me step down to 6.5 again. When I am in vibration mode and I have a miss call, my phone vibrate forever.